A spectacular new image from the NASA/ESA Hubble Space Telescope of the group of galaxies called Stephan's Quintet provides a detailed view of one of the most exciting star forming regions in the local Universe. Stephan's Quintet is a favoured object for amateur astronomers and has earned a reputation as a challenging target for good hobby telescopes. The quintet is a prototype of a class of objects known as compact groups of galaxies and has been studied intensively for decades. This NASA/ESA Hubble Space Telescope image is a close-up view of the central part of Stephan's Quintet, giving a magnificent view of a gigantic cosmic collision. Weird, highly distorted features, dust lanes crossing between galaxies and long filaments of stars and gas extending far beyond the central regions all suggest galaxies twisted by violent encounters. The galaxies float through space, distorted shapes moulded by tidal interactions, weaving together in the intricate figures of an immense cosmic dance, choreographed by gravity. Stephan's Quintet, as its name implies, is a group of five galaxies (NGC7317, 7318A, 7318B, 7319 and 7320) and lies about 270 million light-years away in the constellation of Pegasus (North-west of the Great Square of Pegasus). A sixth galaxy (NGC 7320C) lies south-east of the other five (upper left-hand corner of the overview image). The galaxy group was the first of its kind to be discovered and was found by the French astronomer Edouard Stephan in 1877, using the Foucault 80-cm reflector at the Marseille Observatory. 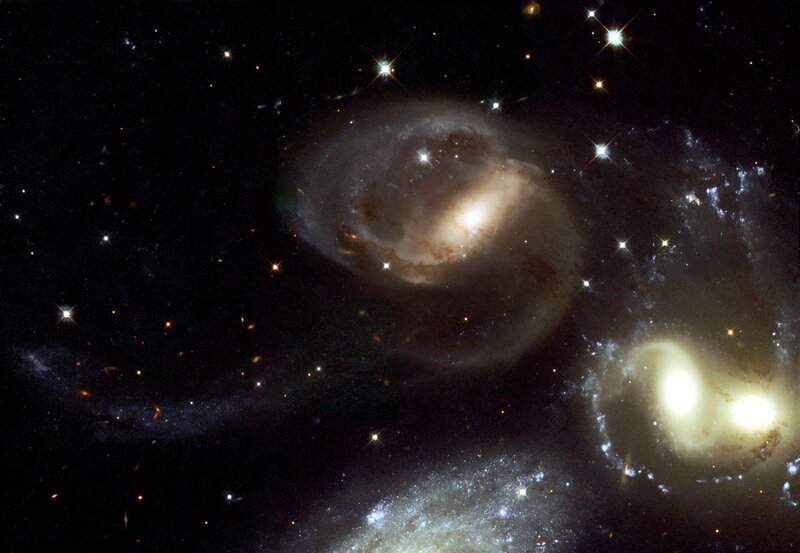 Today we know of hundreds of similar groupings, but few are as spectacular as Stephan's Quintet. 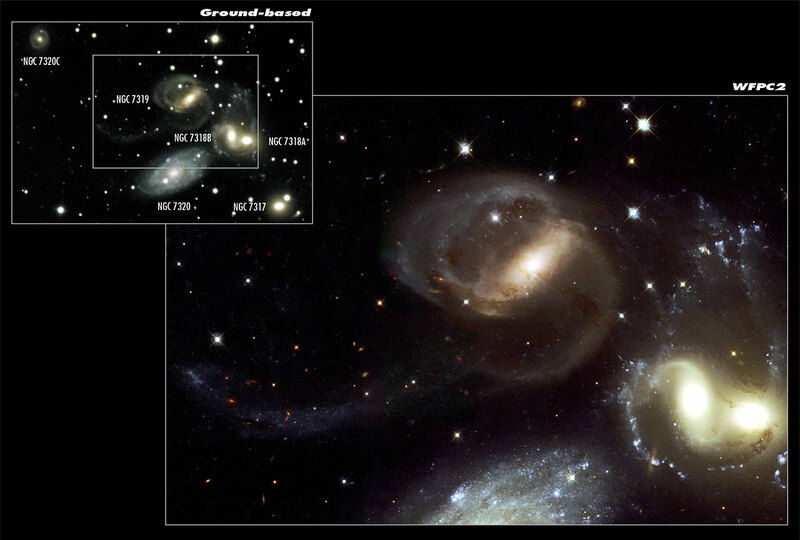 Historically, observations of Stephan's Quintet contributed significantly to the debate concerning the validity of redshift as a measure of distance. 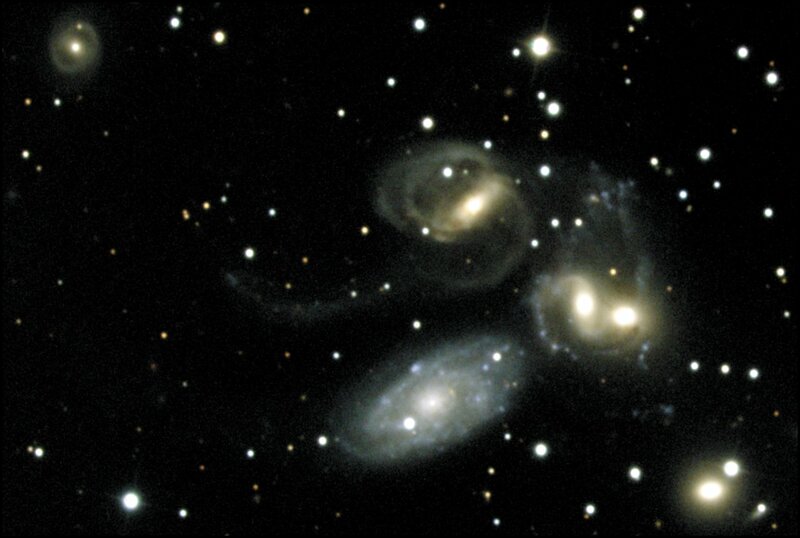 In 1961 Geoffrey and Margaret Burbridge obtained spectra of the galaxies in Stephan's Quintet. Their observations revealed that all but one of the galaxies are receding from Earth at about the same velocity (~6000 km/s). The discordant galaxy (NGC 7320 seen in the bottom of the Hubble image) is receding much less rapidly (~800 km/s). Some astronomers saw this as evidence that redshift is unrelated to distance, opposing the idea that the Universe is expanding. However, today there is general agreement that NGC 7320 is merely a foreground galaxy, 35 million light years away, projected onto the more distant (270 million light years) compact group by chance. The other galaxies in the region appear to be intimately connected in space. A few hundred million years ago the galaxy NGC 7320C (just outside the left-hand edge of the Hubble image) passed through the group from behind (as seen from Earth). It collided with the galaxies in the group, ripping out gas and stars to form a long tidal tail as it flew by. In the central region the spiral galaxy NGC 7318B (to the right of the centre) at the moment is colliding with the group. This intruder has triggered giant bursts of star formation as it ploughs through the gas dispersed between the galaxies. The newly born stars can be seen as numerous regions of blue stars to the left of and above the NGC 7318A/B galaxies. It is slightly ironic that such immense, potentially destructive collisions not only give rise to clutches of new-born stars, but also, as Mariano Moles says, are vital to the survival of the group: 'The incoming galaxies transfer energy to the group and so prevent the galaxies of the group from collapsing and merging together totally. One would otherwise expect the group to collapse within a few hundred million years, which is clearly not the case'. Despite being one of the most active regions in the Universe, constantly under the influence of interacting galaxies, Stephan's Quintet is still thriving and preserves a well-defined identity. This image comes from the large archive of scientific observations performed with the Hubble Space Telescope. It is a mosaic of two pointings with the WFPC2 instrument made in December 1998 and June 1999. The natural-colour composite has been constructed by the Hubble European Space Agency Information Centre from individual exposures in red light (814W filter, 2000 seconds), in green light (569W filter, 3200 seconds) and in blue light (450W filter, 6800 seconds). The image measures 3.7 x 2.5 arc-minutes. The Hubble Space Telescope is a project of international co-operation between NASA and ESA. The original Hubble images were obtained by J.C. Charlton from Penn State University, USA and collaborators.